First and foremost, a HUGE thanks to long time Joe friend and fellow website admin Fred from JoeBattleLines. For folks who don’t follow me on Twitter, you may not know this, but during my trip to JoeCon, my beloved Fuji digital camera got destroyed in transit. That’s one of the reasons why my pictures from JoeCon were all of the less-than-optimal smart phone variety. So, fresh off an expensive JoeCon trip, I was faced with the distinct possibility of replacing my camera. Well, Fred heard my dilemma and without hesitation, sent a loaner in the mail to me at his own expense. It was that camera that I used to take all of the pictures for these reviews, so make sure you thank Fred for his quick generosity. It’s quite possible these reviews may not have happened nearly as quickly without his help. While you’re at it, check out JoeBattleLines.com or on Facebook or Twitter to see his Joe reviews and general geekery. Now, on to the review talk.. In previous years I had sort of combined all of the individual pieces into one review, but it was getting arduous and lengthy, and I felt like each individual part of the set was not getting its due scrutiny. So starting last year I broke everything out into individual reviews, all linked to one central “Set Review”. Is the format perfect? Nope, probably not. And really, in my opinion, there’s no way to slam out 20 reviews in 2 weeks time without some of it sounding repetitive. Hopefully I do these toys justice, because there are some fantastic ones in here. You can hit up the G.I. Joe Collectors Club Review page, or just click the link below for this monster. This will hopefully be a good way to kill a couple of hours on a busy Monday. So just prior to the 2014 G.I. Joe Convention, the What’s on Joe Mind crew got together and recorded Episode 93…this was, of course, before Episode 92 was even finished yet, but we wanted to get Convention preparation online as quickly as possible. From the floor of JoeCon we kept the recorder flying, and have posted a number of quick “One Shots” from Package Pick Up night and from the Custom Class itself. All told we recorded several hours worth of content throughout the weekend, including many of the seminars, and pending approval from The G.I. Joe Collectors Club, we’ll hopefully be able to post some of those. Until then, though, enjoy our coverage (so far) of the 2014 G.I. Joe Convention! Why episode 93?! Well, because episode 92 is not ready yet. However, this one is ready and why make anyone wait? It’s our “LIVE” show before JoeCon. Once again we are joined by the Vice President of The Crappy Figure Brigade, Don Anderson. We finally let Chuck talk a little wrestling, but really this episode is about one thing, JoeCon. The guys will preview the convention schedule and will give you an up-to-the-minute AccuWeather forecast for Dallas. It’s raw and unfiltered and contains 50% more Chuck – so play this out of earshot of kids. For the rest of the updates click the Continue Reading link below, and huge thanks to Planet Nerd Rage Productions for sponsoring the WOJM coverage for JoeCon 2014! The whopper FSS 3.0 news wasn’t all that the G.I. Joe Collectors Club revealed this year… they also gave us an idea of what to expect for next year’s Membership Incentive items, and yes, they will include a figure AND a vehicle! The Collectors Club announced today that next year’s figure will be Arctic Dr. Mindbender with a new head sculpt! This is great news for Joe fans who weren’t wild about the 25th Anniversary head sculpt, plus the Club was sure to mention that he’d have his classic accessories as well. 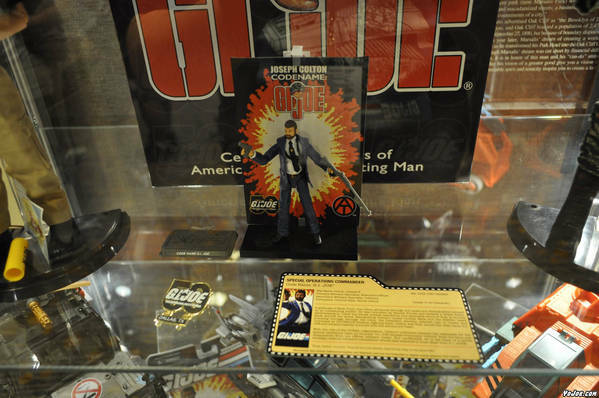 Along with the great information about FSS 3.0, the Collectors Club also showed us some great behind the scenes information about the design and execution of the 2014 G.I. Joe Convention set. Included in this presentation was several slides with deco work on the convention exclusive figures, and even some great original Hasbro concepts for figures like Outback and the Steel Brigade Zombie. Check out some great images at the YoJoe Photo Gallery, but also some of my hackneyed smart phone shots below! G.I. Joe Collectors Club reveals FSS 3.0 selections! The big news of the G.I. Joe Convention has hit the web, and we now know the line up for the third rendition of the Figure Subscription Service! Not only that, but the Collectors Club also let us know what the 2015 Incentive figure will be as well as information about another new incentive vehicle! Alpine v2 (Spy Troops) – Newly sculpted Boss Fight Studios head! Hit & Run (Concept Case) – I have nothing to say here. Speechless (in a good way)! Musktrat – Vintage colors with a newly designed swamp skimmer by Boss Fight Studios! Big Ben – Newly sculpted head from Boss Fight Studios! So yeah… I’m pretty ecstatic about this line up. It is really phenomenal. Brian from the Collectors Club did say that all of these Night Force figures won’t necessarily be straight repaints, there will possibly be different gear or parts adjustments. Also they mentioned they will be revisiting the 13th figure concept and making something more desirable for FSS 3.0 based on fan feedback. So folks complaining about the 13th figure, time to put your money where your mouth is and subscribe! Check out the images below for some artwork ideas about what they’re planning! Watch GeneralsJoes and YoJoe for Convention News and Intel today! If there was ever a day when you wanted to watch GeneralsJoes and YoJoe closely, today is that day! The G.I. Joe Collectors Club round table explodes today at 3:00pm Central Time (4:00pm Eastern) and we expect some big news, including hopefully info about the third round of the Figure Subscription Service! The absolute latest info will appear in those places before the main site proper, though I will do a full recap on the site itself as soon as I am able. While I’ve been busy running around, intrepid photographer and admins for YoJoe.com have been conspiring to keep up to the minute coverage flying to the YoJoe Facebook page. If you haven’t already “Liked” that page, I’d strongly recommend you do so this weekend, especially since there are likely to be some big reveals coming from the Collectors Club tomorrow in relation to FSS 3.0. So check out YoJoe on Facebook and stay in the know! First and foremost, I must apologize. I know I’m typically right on top of this stuff, but I took some volunteer shifts with the Collectors Club this year, and as such, haven’t had as much time to report on what’s been revealed so far. Pretty much what I stated in my post from yesterday morning has held true, including Clutch, the VTOL aircraft, and the Septic HISS. The Collectors Club also surprised us by releasing a separate 4 x 4 Zombie Hunter VAMP, which had not been revealed in the program the night before. So there were some very nice offerings this year, and at this point, my favorite extra is probably a mix between Clutch and the Steel Brigade pilot, who are both some really nice, modern builds, and I love that the pilot has some homage to the 2005 Steel Brigade Convention set. Phil over at YoJoe has been doing an awesome job flooding the YoJoe Image Gallery with photos of the exclusives, so check out the photos over on YoJoe.com for the latest info! Yes, I realize this is likely old news, but I wanted to get it out there anyway. Many folks were wondering what head sculpt would be underneath Repulsor’s helmet, and it looks like the answer is 25th Anniversary Red Star! With the black hair I think the head works more than well enough for a unique character. Also revealed is the Attendee Exclusive ECO Striker, which awesomely uses the G.I. Joe: Retaliation AWE Striker tooling. I’m thrilled about this! Yes, it’s still the AWE Striker, but at least it’s got some fresher parts than the standard release AWE Striker we’ve gotten countless times over the years, and the large launcher on top much better resembles the water squirter from back in the day. Check out the AWE Striker below. As usual, by examining the comic book/program that came with the boxed sets last night, you can get a decent idea of what the exclusive items might be once revealed tonight. I’ve included some small images from the comic, and a run down of what we can probably expect. No real idea about the pilot himself, but a quick panel from the comic shows the Pursuit of Cobra Ghost Hawk, which is definitely a VTOL aircraft, so that would seem to answer that question. I wonder if it’s color scheme will be based off the Steel Brigade Sky Hawk from 2005? Images from the comic show a DTC HISS! That is a pretty pleasant surprise, I suspect. We haven’t seen this vehicle since it was used in the DTC line, and it was a surprise to me to see that the Club may have used it for this convention set. Near the end of the comic, Clutch and an unnamed driver of an ECO Warrior themed Ninja Combat Cruiser appear! We see no mention of the Combat Cruiser itself, but we do see Clutch and a small hint of a driver, who almost looks to be wearing a knit cap? Perhaps these are the two “Rescue Ops” members? I think it’s safe to assume these are based off the concept case figures, and they are shown throughout the comic as well. Now, neither the Kre-O set nor Night Force Crazylegs were shown in the comic (unless that’s Crazylegs driving the jeep with Clutch, considering the PoC version had that knit cap underneath his helmet) but I think we can all assume what we’re getting there. It’s still unknown to me whether or not Crazylegs is indeed the “Parachute” figure. It certainly seems likely, but the Club did not explicitly state that in the program. They did mention that he’s a “Paratrooper” so that really seems to lead that direction, though. Something tells me ole Crazylegs might be the sleeper hit this year. Check out the full gallery of images below.